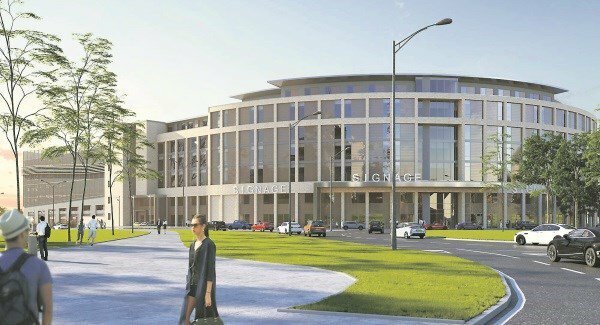 The ambitious plans for the retail centre’s northern section, close to Cork University Hospital and the Maternity Hospital include a 190-bed hotel set to serve hospital visitors among other guests, a 14-screen cinema, a public plaza, a giant two-storey Penneys unit, and some other “big box” new retail space, along with an 874-space multi-level carpark among other additional parking provisions. Behind the plan are retail investors and developers Clarendon Properties who acquired the Wilton Centre as part of a portfolio sale in 2015, for about €70m, and who now control a number of other prime Cork shop investments after a buying spree. They have now adapted and significantly updated previous Wilton Centre owner Joe O’Donovan’s plans to enlarge the asset, which has more than 60 traders, plus a separately owned Tesco Extra, added on in 2003. The planning, being submitted via architects Henry J Lyons for global fund company Montlake QIAIF Platform ICAV, with York Property Fund II, is for a 10-year permission on the 11-acre suburban site and includes an environmental impact assessment report. Issues such as access and traffic flows — of interest to Wilton and Bishopstown residents, as well as to existing traders and neighbours — will be addressed in the report, and the planning application includes the suggested provision of a second vehicle access point on Sarsfield Rd. A preliminary public information meeting on the investment plans was held in mid-January, outlining the sections of the site and shops complex to be redeveloped and upgraded. The plans now going for planning consideration include removal of the current Homefront and 40,000sq ft Penneys store (previously Roches Stores) at the Wilton site’s northern end, plus the removal of 420 surface-level car spaces. The centre’s two existing malls, home to up to 60 traders with 500 employees, plus the 24-hour Tesco store, will remain unaffected. Developed by Clayton Love Jr, and having changed hands several times over its history, the original Wilton centre opened in 1979, and was enlarged in 2003, with a public library added in 2006. Subject to planning permission and any alterations will be a 75,000sq ft Penneys shop over two levels, other new large retail units, plus cafes/restaurants, and the new buildings will go out to the site’s boundary by the Wilton roundabout/Bishopstown Rd, at heights of two to seven storeys, with a cinema above shops. A multi-level carpark will bring 874 spaces, compensating for the loss of the 420 surface-level spaces, as well as a carpark deck on the roof of a two-storey retail section with 257 spaces, plus 227 bike and 70 motorbike slots, replacing 178 surface car spaces. A new element is the 14-screen cinema, for more than 1,500 patrons, as well as a 190-bed hotel, within a two-minute walk of the CUH/CUMH medical and teaching facility, which serves a catchment of 550,000, with more than 3,000 staff, and where 7,500 babies are delivered each year. A spokesperson for Clarendon noted that “the Wilton Shopping Centre has effectively been a carpark for all of Wilton, while the CUH/CUMH is not being served by a convenient hotel, and our plans positively address a number of these points”. The design team for the €100m-plus Clarendon investment include architects Henry J Lyons, Arup engineers, Aecom consultants, Linesight QS, and Butler O’Neill planning consultants.